Why risk one of the most important days of your life with someone of less experience, knowledge and wisdom? This is the beginning of your new life with your significant other. It’s critical to capture this magic while also preserving those memories of not only people who will not be around forever but also the finer details of the day. 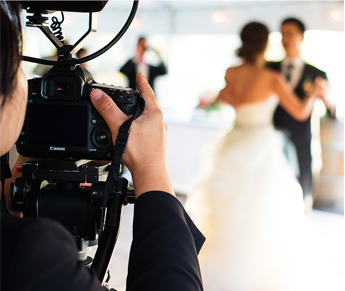 The best way for you to index and remember this day is by hiring Ella Bella Productions to film your wedding. Ella Bella is based out of Madison, Wisconsin and we specialize in wedding videography. We’ve shot weddings all over Wisconsin including Madison, the Wisconsin Dells, Milwaukee and everywhere in between. We just don’t stop our coverage area to just Wisconsin. We’ve had some fun in Illinois including Chicago and Rockford areas along with venturing into Iowa a bit too. Your wedding day only happens one time and it’s important that you hire a company like us to ensure you will not have any flaws. Style is something to also think about. Many companies like to lean towards one style or another. Ella Bella Productions is about customer satisfaction and exceeding your expectations. Don’t be pigeon holed into one style or kind of video when all you have to do is ask and tell us what you want. Don’t take a chance of having your wedding video preserved in a sub-par fashion. We can easily provide you with the stunning shots you long for while also including you into the process of the edit. This ensures the final product of your dreams.